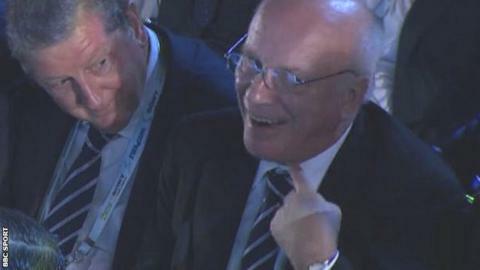 England's 2014 World Cup prospects may have been reflected by Football Association chairman Greg Dyke running a finger across his throat as he sat alongside manager Roy Hodgson when the draw was concluded in Brazil. It was all perfectly innocent of course, but Dyke's cut-throat gesture sparked an instant response on social media and appeared to mirror the feelings of the majority of England supporters about being thrown in Group D alongside Italy, Uruguay and Costa Rica. In both a football and geographical context, Hodgson and his players have been handed the most difficult of assignments. There will now be an extra sense of urgency about England's World Cup planning. England's campaign will open against Italy at 23:00 BST on 14 June in Manaus, the city among the Amazon rain forests they would have preferred to avoid, with its tropical climate that brings fierce humidity which can reach 99%. The mayor of Manaus, Arthur Virgilio, has already suggested Hodgson's England will not be welcome because the manager said - with perfect justification it should be stressed - that it is a location that would not be ideal for the European teams in Brazil next summer. It is unlikely Cesare Prandelli's Italy, who knocked England out of Euro 2012 on penalties in the quarter-finals, will be any more accommodating or hospitable than the angry mayor. It is a long flight from England's proposed base in Rio and is one of many elements that made this a less than satisfactory draw for Hodgson and the FA. Manaus is a five-hour flight from Rio and it may be that the FA could even give some consideration to switching bases, although there is the precedent of staying in Krakow in Poland during Euro 2012 and flying to Ukraine for games in Donetsk and Kiev so it is likely their plans will stay in place. Hodgson's side will have a chance to acclimatise to similar humidity conditions, albeit not as severe, with a training camp in Florida before they head to Brazil in June, along with their final warm-up game in Miami. England's recent friendly defeats at Wembley against Chile and Germany asked questions about their ability against the highest calibre of teams. They were not answered successfully and the examination will not get any easier in Brazil. Ironically, England's World Cup winner and hat-trick hero against West Germany in 1966, Sir Geoff Hurst, played the key role in putting the four teams together. And "The Group Of Geoff" presents a hazardous proposition. After playing Italy, England take on Uruguay in Sao Paulo five days later before ending their group games against Costa Rica in Belo Horizonte on 24 June. There is even historical significance attached to Belo Horizonte, as this was the place that played host to one of the darkest days in England's World Cup history on 29 June 1950 when a team containing Sir Alf Ramsey, Sir Tom Finney and Stanley Mortensen lost 1-0 to the United States. From a football perspective, England will feel this group draw has been desperately unkind to them - but after a period of measure and reflection they will also feel it is one they can get out of. Uruguay, however, will be a huge threat and that threat will be parked on England's lawn for the rest of the Premier League season in the shape of Liverpool's Luis Suarez. And this is before we even touch on his outstanding strike partner Edinson Cavani, whose stature was reflected in his £55m move from Napoli to Paris St-Germain this summer. Suarez is in the form of his life, as his one-man attempt at Goal of the Month with four goals (three of quite stunning quality) against Norwich City in Liverpool's 5-1 win proved. And with the centre of England's defence, where Chelsea's Gary Cahill and Everton captain Phil Jagielka currently hold down the places, touted as an area of concern against the world's best, Suarez and Cavani will put that to the test as never before. Suarez's performances at Liverpool have had manager Brendan Rodgers placing him in the same category as Barcelona's Lionel Messi and Real Madrid superstar Cristiano Ronaldo. England's defenders may be able to study him in the remainder of the league season, but such is the range of tricks and talent at his disposal it is unlikely they will be comfortable for a single second of their World Cup group game. England captain Steven Gerrard will also be able to examine his Liverpool team-mate Suarez at the closest of quarters for the rest of the season at their Melwood training headquarters - but devising a plan to stop him and being able to carry it out successfully are two entirely different things. Uruguay had to go through the play-offs to qualify, which will give England cause for optimism, but in their own South American conditions and backed by fervent fans, Hodgson's team will start as underdogs. The meeting with Italy is intriguing and while Hodgson may not regard Manaus as ideal, it is worth making the point that a trip to the Amazon in northern Brazil will be equally unfamiliar to Italy. Italy may have the psychological advantage of that Kiev win on penalties against England but Hodgson will call on that same resilience that somehow got the game to penalties and hope to avoid spending as much time without the ball as they did in Ukraine, when the grand orchestrator Andrea Pirlo tortured them with a masterclass in how to retain possession. Mario Balotelli will no doubt provide a backdrop to this game but it is not the fearsome Italy of old - Prandelli is still trying out attacking options with former Manchester United striker Giuseppe Rossi hoping to stake a claim. There is the evergreen Gianluigi Buffon in goal while Daniele De Rossi will also provide midfield force, but there is no need to be defeatist about this one as far as England are concerned in a game that will be pivotal to deciding the group. And England have also been drawn against Costa Rica at a time when one of their most famous exports has been making big headlines. Everton's talented defender Bryan Oviedo scored the winner that ended a 21-year wait for a victory at Manchester United. They also have the quality of Fulham's Bryan Ruiz and the talented young Arsenal-owned Olympiakos striker Joel Campbell. If England need a reminder of Costa Rica's shock potential, they can always recall how they stunned Scotland 1-0 in Genoa in Italia '90. Feelings about a World Cup group draw are always framed by that initial reaction and a look around the rest of the draw at what might have been. There is no doubt England have been left with a dangerous route towards the knockout stage and the FA delegation may leave Brazil with a sense of deflation - but it hardly represents a lost cause either.